This is the first of my attempts at a Charm Bracelet. 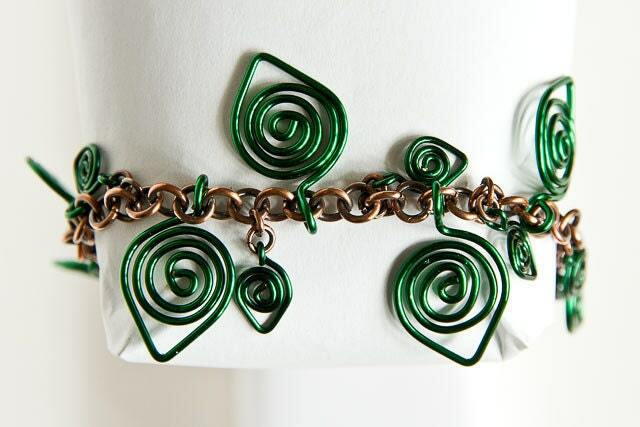 Its essentially a simple chain style copper bracelet made from small jump rings, with coloured wire charms added to it. The copper part has been artifically aged and polished - this ensures conistency of finish and gives it that antiqued copper look, the leaf charms were attached afterwards. The idea of the copper and green plated wires is to somewhat mimic natural colours(brown branches, green leaves). Included in the sale is one copper bracelet and a presentation box as pictured. This charm bracelet measures approx 7 1/2" inches or ~190mm. Folksy :: Buy "Copper Leaf & Green Crystal Necklace"
Folksy :: Buy "Polymer Clay Brooch Beanstalk with Green and Brown Leaves"